Before we ever left home, Brian’s friend Andrés Thomas Conteris was working his connections at Democracy Now! to get Brian on the show during his East Coast book tour. He and other friends sent the book to show producers to help convince them it was a good idea. “It is almost assured,” he said, “that if you make it to New York City,” you will be on the show. But no such promises were forthcoming from the show’s producers. Meanwhile, Robbie Lepzer and Scott Christianson, who also have personal connections at DN!, made calls to endorse Brian as an important guest to feature on the show. We were hopeful, though of course we understood that any plan to interview Brian could easily be bumped by a big breaking story. Soon after arrival at our friends’ apartment in New York City, Andrés called to tell us we should expect a call from a Democracy Now! producer, and to make sure we could be reached at that number. Finally, one day in advance, we connected with one of the show’s producers and managed to schedule an interview for Thursday, Oct. 27, just before we were to catch a train to Philly where Brian was speaking that night. We packed light and did not bring my computer. We were able to walk to the station from where we were staying and arrived in plenty of time. It was fun watching Amy on the television in the reception area, taping various radio spots and then apparently studying Brian’s book while she munched on a mid-morning snack. 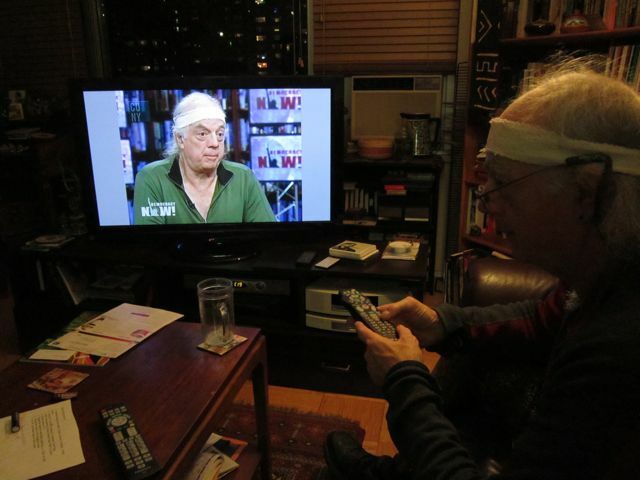 When Brian was finally ushered in, I got to watch the interview on the same TV monitor as it was being taped. At first he looked down a lot, apparently feeling somewhat shy, but after a while he warmed up and Amy’s prompts helped him unwind his amazing story yet again. (He’s of course been practicing his talk, having appeared at sixty-plus book talks over the past few months.) By the end of the interview, it appeared to me that Amy was really taken with Brian, and she actually followed him out of the studio with her cellphone to take photographs of him walking on his colorful prosthetic legs and getting on the elevator as we hurriedly left to catch the car they had called to take us to Penn Station. The car had been kept waiting because although we were told we’d be leaving at 11:40am, it was more like 11:55 when the interview finally ended. We didn’t know then whether it would be aired the next day, Friday, or the following Monday. Producers asked if we could supply high-def still photos for the show, if possible, and also requested the video of Brian being run over, which had been captured by his friend Bob Spitzer on September 1, 1987. We were told by producers as we left, “Amy is keen to have that video for the show.” And so, when we arrived in Philadelphia, that was my main focus. Using a loaned computer and a loaned cell phone, I made calls to Ramsey at PM Press requesting photos to be sent and to various friends back home who I thought might be able to help us get the video of the assault uploaded (the DN! producers, meanwhile, informed me they definitely needed it for Friday). Finally it was the B Media Collective who answered the call, picked up the DVD from our housesitter, and made it happen. We are very grateful to them, to Brian’s publisher for seeing that all the still photos were sent, as well as to the show producers who masterfully combined all those visuals with the interview for the televised version of the show, and of course to Amy Goodman herself, who is simply an amazing human being. Although that coffee they were serving at the studio was pretty high octane, as described by the rockstar receptionist, I know it’s something far more powerful that drives Amy to do what she does so well, day in and day out. We didn’t actually see the show ourselves until we returned to the Democracy Now! studio the next day to pick up Brian’s personal dog-eared copy of Blood on the Tracks which he had left behind, at which time we were also gifted with multiple copies of the show on DVD. We were of course delighted to find that they had devoted the whole program to Brian. We again had the brief pleasure of interacting with Amy who told us as she was running out the door that she had been promoting Brian all morning. Why? Well I suppose because she also believes, as Brian would say, we are all connected. As serendipity would have it, Brian’s favorite baseball team (from childhood), the St. Louis Cardinals, wound up winning the World Series the same night. He went to sleep with a big smile on his face. Click here to watch Amy Goodman’s interview with Brian on Democracy Now! 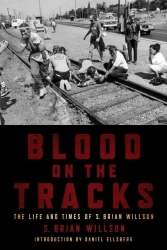 This entry was posted in Blood on the Tracks, Book Talk, Book Tour and tagged Amy Goodman, B Media Collective, Democracy Now, St. Louis Cardinals. Bookmark the permalink. Watching the full hour w/Brian and Amy led to a sudden shift in my consciousness. Even though I was raised in a Radical Left Wing environment where my mom was accused of being a Communist by the John Birch Society, it has taken me 60 years to come to and fully realize the full atrocity of American Foreign Policy. And we call ourselves a Christian Nation, when Christ himself was a Peace Activist? I am looking forward to reading the book. And telling everyone I know about it. Thanks for the report, Becky. I am so grateful to Amy Goodman and the DN! and of course, Brian, for doing this interview. I hope lots of people read the book and begin to take action to change the world. The DN show with Brian was powerful beyond words. I am looking forward to the two of you getting home and being able to check in with you in person. I am so honored to have gotten to know you both in Portland and want to fill you both in with what has been happening locally with OP and with Paul Cienfuegos’ work here in Portland. I am talking Brian’s book where ever I go.